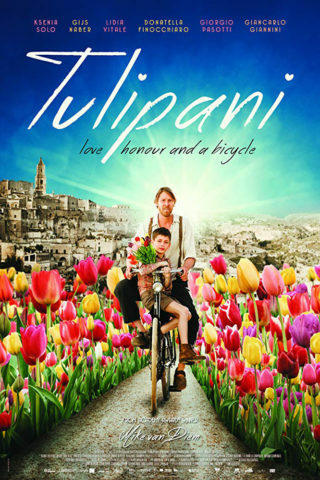 Tulipani tells the story of a romantic Dutch farmer named Gauke (Gijs Naber) who after losing his farm during the floods of 1953 is determined to never ever have wet socks again. He cycles to the sizzling hot south of Italy to start a new life and ends up at the outskirts of a small village in Puglia. Due to his fairylike and miraculous tulip trade, his passionate love-life and his turbulent scuffles with the dubious local business practices, he becomes a living legend – to then suddenly disappear. Thirty years later, an Italian police inspector (Giancarlo Giannini) attempts to unravel the story but struggles to distinguish fact from fiction. With the help of the young Canadian Anna (Ksenia Solo), he discovers what truly happened.